This is my first Campbeltown, and I am very excited about it. There are a couple Springbank whiskies I have been looking at and trying to decide upon at the local shop, but I wanted to taste this 15yr I received as a sample first. I am not sure what to expect from it, honestly. 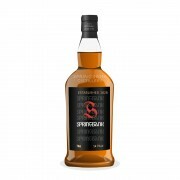 The Springbank 15yr is 100% matured in ex-sherry casks, and is bottled at 46%. Nose: Smoke and spice! A bit of pepper. This is definitely a close cousin of Islay whiskies. Some salty sea air comes through after the smoke. There is just a hint of pear in there somewhere. I'm returning to the nose after the first taste, and I am still not getting the sherry influence. Perhaps this is because I just tasted the Sonnalta PX and Nectar D'Or from Glenmorangie, but I really expected a better performance from a whisky that was 100% matured for 15 years in sherry casks. Body: Medium body, with a rich mouth feel. Palate: Spicy! A bit of smoke coming through. A touch salty. On my second sip, I am getting just a hint of fruit. Honeydew melon? Not really sweet. Finish: Smoke, salt & pepper. Springbank 15 Year Old Tastes like trade. Coming back to this whisky, I am getting basically the exact profile, but this time I am tasting the whisky as the first of the day. It is good, but I still expect a lot more from a whisky matured 100% in ex-sherry casks.